Since late 2014, an outbreak of highly pathogenic avian influenza H5 has gripped the U.S. poultry industry, killing close to 50 million chickens and turkeys in 19 states, according to the U.S. Department of Agriculture. Although the virus hasn’t reached Ohio, experts with OARDC and OSU Extension are helping poultry producers learn about the disease, boost their biosecurity and prepare to minimize the flu’s impact should it get here. For example, Fred Michel, an OARDC biosystems engineer, and Mohamed El-Gazzar, OSU Extension’s poultry veterinarian, are developing a plan that would allow Ohio egg farms, if needed, to compost hundreds of thousands of dead chickens onsite. This would cut the risk of the flu spreading. 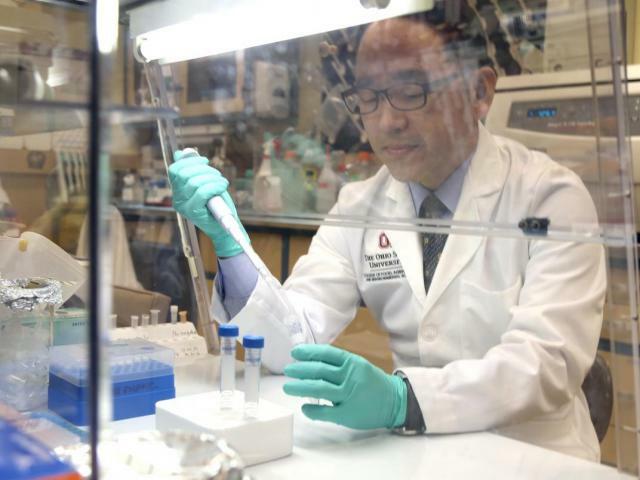 OARDC virologist Chang-Won Lee (pictured) leads a $7.2 million USDA project that aims, among other things, to develop a better understanding of poultry diseases and more-effective ways to prevent them. Ohio’s poultry industry is worth $2.3 billion and directly supports more than 14,600 jobs, according to the Ohio Department of Agriculture. Nationally, Ohio ranks ninth in turkey production and has now surpassed Iowa as the top egg producer. To contact the sources: Fred Michel at michel.36@osu.edu; Mohamed El-Gazzar at el-gazzar.1@osu.edu; Chang-Won Lee at lee.2854@osu.edu.